"Bodies is James Saunders' fourth play to appear in London's West End." "Bodies is a play for two men and two women. Mervyn, Anne, David and Helen are "middle-class, rate-paying" couples "approaching the evening of their lives". Years before, each had had an affair with the other's partner. For nine years they have not met. Now, hearing that David and Helen have returned to England from abroad, Mervyn, without consulting Anne, has asked them over "for a meal on Saturday". Helen accepted. In the intervening period of their absence Helen and David had undergone a course of therapy. This made a considerable difference to their manner of life: but David supposes that the other couple will not have changed much. The meeting leads to a discussion in which a very great deal of the inner lives, opinions, prejudices and outlooks of the four protagonists - and indeed, perhaps of all of us - is laid bare. In the first act dialogues between the couple in their separate houses alternate with monologues from each character in which earlier events are recalled. The second act is set in Mervyn and Anne's home, in a more straightforward style, on the evening of that significant meeting." 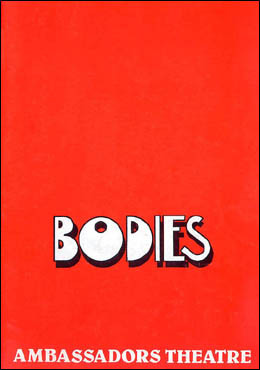 "Bodies ... is a play which, when we have laughed at its wit, have been held in the grip of its drama and revelled in the colours and layers of its language, still raises echo after echo in our minds and hearts." "This play by James Saunders positively glitters with rhetorical brilliance." "Saunders writes with a fastidious wit and subtle cadence that delights the ear." "His best play to date."